A page from AVENGERS #32, part of ORIGINAL SIN, had Captain America in the far future talking to Franklin Richards about the Incursions and how to stop them. And there is an image of a white Iron Man armor fighting a high-tech Captain America armor. AVENGERS #32 in an ORIGINAL SIN tie-in, but doesn't have much to do with ORIGINAL SIN. After that Watcher's eye knowledge bomb, Captain America remembers the Illuminati mind-wiped him. He goes after Tony with some Avengers, then the Time Gem appears and sends the group into the future. This happens twice, each time with some team members getting sent back to the present. Fantastic Four #5: "I Killed Julius Caesar!" January's issue of FANTASTIC FOUR gave us Ben celebrating New Year's, February's was a special Valentine's Day issue. Now this month's brings us the Ides of March. The FF as we have come to know them have come and gone, as this wraps up the last issue of the group and of the team as we know them, with a special emphasis on Franklin Richards, arguably the most powerful mortal in the 616. Older Franklin is teaching current Franklin the ins and outs of godhood, and making "one last tour of the field", as Future Franklin must leave. 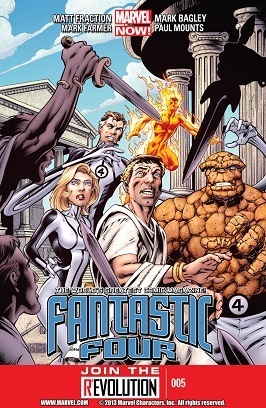 The issue has a lot of stand out moments with Marvel-ous moments of mirth and wonder, but the true core of the Fantastic Four is, and always has been, why Reed Richards, Susan Richards, Johnny Storm and Benjamin Grimm and the people they love are the First Family of the Marvel Universe. This is the PSA where Reed Richards learned to not be too distant a father. To be precise, it's the PSA where he'd already learned that. His education in the matter's the stuff of a cautionary tale, related to a guy named Joe who has a kid named Ray he could be spending more time with. Spider-Man, who'd found the latter graffiting in the dead of night, had brought the former to Four Freedoms Plaza in hopes that Mister Fantastic could get him to see sense. Spidey's own efforts to that end, perhaps fueled by a discussion with his wife about the possibility of their trying for another child (surprising use of continuity in something like this, isn't it? ), hadn't been enough. He'd told Joe the barfly that " Immaturity is the one foe even I can't fight! ", knowing that what could was wisdom in the matter. So he'd asked Reed (because who else could Spider-Man the superhero ask?) to talk to Joe about how important a father was to a son. 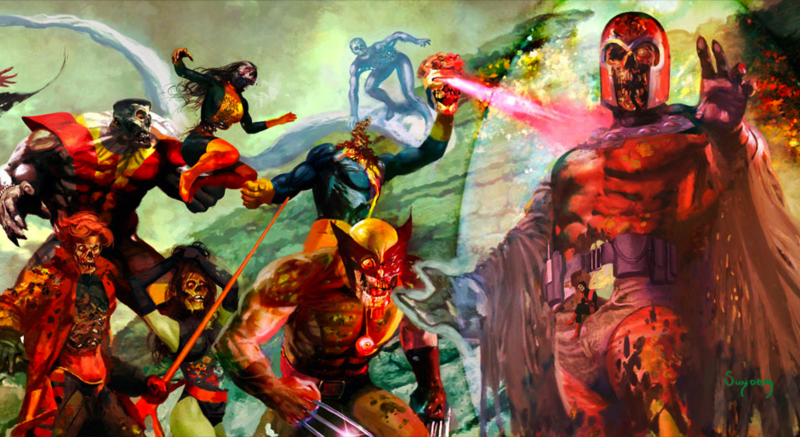 ComicBookResources has the solicits for January 2012. And I can see a few that look interesting, and I know someone's been looking at my fan art for inspiration (again). ComicBookResources has the covers of the December issues. You can practically sing along to it.